Following the success of Sushisamba on the 38th and 39th floor of Heron Tower the long awaited sequel, Sushisamba Covent Garden, takes over Opera Terrace overlooking the Royal Opera House in Covent Garden from November 2018. 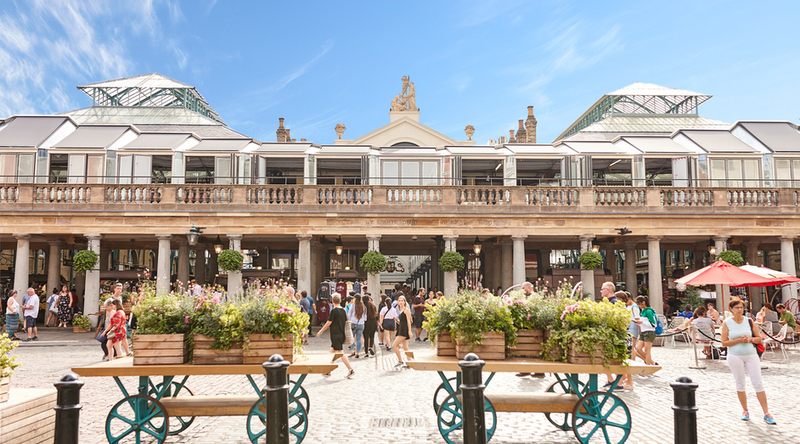 The Market Building restaurant has a terrace which runs along the entire east side of the market, giving wonderful views across the piazza. Both the food and interior design - by Antwerp-based Too Many Agencies - are a combination of Japanese, Brazilian and Peruvian influences. Dishes on the menu include pork belly with butterscotch miso, scallops with vanilla, jalapeño, mango and aji amarillo and octopus with aji panca, peppers and nori. Rich Woods has created signature cocktails like the fiery Tom Yam, made with vodka, coriander, ginger, lime leaf and chilli; and the Lychee Cooler, which mixes vodka with lychee juice, coconut milk, vanilla syrup and elderflower. The restaurant is also home to one of the largest premium sake selections in the world and it's not short of Japanese whisky either. Sushisamba Covent Garden gyms, sporting activities, health & beauty and fitness. The best pubs near London Sushisamba Covent Garden. Sushisamba Covent Garden clubs, bars, cabaret nights, casinos and interesting nightlife. Where to have your meeting, conference, exhibition, private dining or training course near Sushisamba Covent Garden. From cheap budget places to stay to luxury 5 star hotels see our special offers for Sushisamba Covent Garden hotels, including Strand Palace Hotel London from 85% off.